I know this may sound weird, but I have a phobia of whales, which is why there is NOTHING funny about this Howl-o-ween costume from Trixie & Peanut. I can't speak for Paddy, but there's just something unnatural about whales that freaks me out. Seriously. 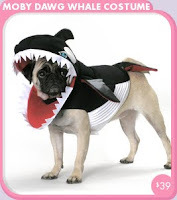 Why you would dress your adorable, cuddly pooch up as a big ol' scary whale?